The words “Hollywood” and “Glamour” are nearly synonymous, so it shouldn’t be surprising that when the Hollywood Casino in Shreveport, Louisiana wanted to decorate, they wanted to go big. In 1999, the owners of the Hollywood Casino had a vision of a radiant, art-deco styled jewel of a casino that fused elegance with function, class with modern convenience, but they couldn’t do it on their own. They had to get Stromberg. 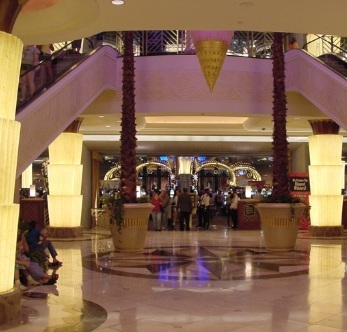 Between ‘99 and 2000, the Stromberg team worked to custom-design and fabricate luminescent columns, massive lighting fixtures, bas relief pilasters and glass panels for the casino. At the core of the Hollywood’s art-deco vision was to transform a night out at the casino into an experience to be remembered. They wanted to control every element of design in order to purge any utilitarian elements and turn every nook and cranny of their casino into part of the experience. Central to accomplishing this goal was the creation of Stromberg’s luminescent architectural fiberglass columns. Architectural fiberglass, or GFRP is a unique, versatile composite material that can be molded into nearly any shape, and can emulate virtually any other building material. The columns, that were custom made for the Hollywood Casino, might not look like they are made from any material from this world, but they are critical for the completion of the Hollywood’s image. 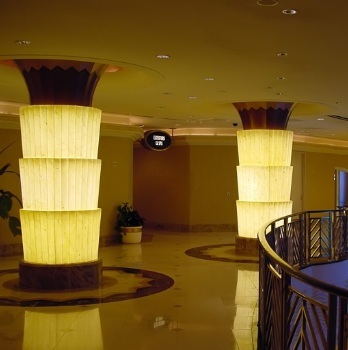 The architectural fiberglass columns are both functional, and beautiful, for even while they illuminate the room with their soft glow, they serve an architectural in supporting the ceiling. They truly represent the marriage between form and function. There is no disputing the aesthetic value of columns; they have been used for thousands of years, and they will likely be used for thousands more. However, beautiful columns have historically only been available to the very rich and very influential. Fortunately, architectural fiberglass is affordable, available and easy to install. In fact, architectural fiberglass was the material of choice for the Hollywood Casino, not only because it is relatively inexpensive, light-weight and versatile, but also because it is remarkably convenient. Architectural fiberglass won’t chip like stone, and it is also easy to remove scuffs, stains and vandalism from GFRP. Benefits of Architectural Fiberglass: Why Stromberg GFRP? GFRP is light-weight, low-maintenance and highly durable. GFRP is affordable, and it is versatile to emulate more expensive building materials like marble, gold and granite. Architectural fiberglass is easy to clean and maintain. Stromberg architectural fiberglass will not rot, corrode or delaminate over time. Architectural fiberglass does not require specialists or experts to install. Shreveport, LA architectural fiberglass, architectural fiberglass in New Orleans, LA, architectural fiberglass in Baton Rouge, architectural fiberglass in Metairie, Lafayette, LA architectural fiberglass, Prairieville, LA architectural fiberglass, architectural fiberglass in Kenner, Louisiana GFRP. For more information on Architectural Fiberglass, visit Stromberg Architectural Products. The experts at Stromberg will help you make your GFRP project a success. They offer design assistance, specifications, and CAD details. If you have questions about Stromberg FRP, the initial consultation is free. Call (903) 454-0904 for more information.